While we live in a society which offers us a huge amount of choice over what we do, for the bigger events the wheel of life more often than not turns in a manner of its own choosing. So when earlier this year the people of the UK chose to elect a party which had pledged to cut central government spending by getting rid of its temporary contract workers, there was little I could do but wait for my contract to terminate then pack my bags. But being a glass-half-full man, I see these little rotations of the wheel as an opportunity rather than a threat. By happy chance we were in Himalayan mountaineering season, and as soon as it became clear my contract wasn’t going to be extended, I began planning my break by looking around for a suitable expedition to join. Climbing very big mountains is not an activity that can be done by following traditional work patterns, as a standard expedition can take a couple of months to complete, and few employers allow more than 5 or 6 weeks holiday a year, let alone letting you take it all at once. We mountaineers therefore tend to look upon the termination of a contract with mixed feelings, and often with rather more relish than we’re supposed to. Choosing the right mountain to climb was fairly straightforward. It’s been my ambition for a while now to climb an 8000 metre peak. There are only fourteen of these in the world and some of them, such as K2 and Kangchenjunga, can be ruled out on the grounds of being ‘suicide mountains’, by which I mean they have so much objective danger on their standard routes (ie. danger out of your control, such as rockfall and avalanche), that climbing them becomes a game of Russian Roulette. Of the remainder, the time of year helps dictate as the monsoon season crosses East Asia from east to west. Expeditions to the Karakoram peaks in Pakistan tend to take place pre-monsoon (June/July) while Himalayan expeditions in Nepal and Tibet more often take place once the monsoon has passed over (September/October). On this basis three peaks in the Himalayas – Cho Oyu, Manaslu and Shishapangma – fitted the bill, and of these I chose Cho Oyu, generally regarded as the easiest of them. With peak selected, choosing a suitable expedition operator was rather more complicated, as several were leading expeditions to Cho Oyu this autumn, all offering different levels of service and pricing. I picked Jagged Globe on the basis that I’ve joined several of their expeditions to smaller peaks, and generally had a good experience. I also signed up to climb Cho Oyu with them in 2008, but later pulled out when uncertainty over climbing permits caused them to switch the expedition to Manaslu, at the time an untested mountain for commercial teams. Although I felt I’d made the right decision, I was surprised at the success of this expedition. My friend Bunter decided to go ahead with it, and I think I can say with some confidence that he became the first ever slightly rotund climber from Halifax to reach the fore summit of Manaslu. It was time for me to follow in his footsteps. Jagged Globe lie towards the more deluxe end of the mountaineering operator market. Although their prices are slightly higher, they provide more support on the mountain, such as additional load carrying to the higher camps and a greater degree of comfort at base camp. The down side of this is that they become more attractive to the less experienced climber, which can sometimes result in clients who should really be climbing something slightly easier. Although we did have a couple of team members who found themselves unable to acclimatise in the heady atmosphere of our 5700m base camp, on this occasion Jagged Globe had assembled quite some team. Our number included an Olympic gold medal-winning rower, a former rugby international who was treating Cho Oyu as a warm-up for a rather more extreme challenge, two runners who had amassed an incredible 120 competitive marathons between them, a veteran climber who in the 1970s had completed the first ascent of the south face of Annapurna III, another who has completed new routes on Gyachung Kang and the Torres del Paine, and an expedition leader who has climbed the highest mountain on each continent solo. Perhaps most impressive of all was one of our Sherpa team, who had climbed Everest sixteen times. My warm-up trip up a few Munros in Scotland, which I was feeling pleased with myself about, was suddenly looking a bit feeble. But never mind, at least my friend Geoff, whom I’d climbed Muztag Ata with, would be there. With his bald head, professorial beard, clothing which has been assembled from myriad bazaars across Central Asia, and tendency to carry a plastic shopping bag around with him wherever he goes, few people look less like a mountaineer than Geoff, and more importantly his presence meant that I’d be able to keep up with at least one member of the team. The lengthy preamble to our expedition involved a sightseeing trip across the Tibetan plateau in a Toyota Landcruiser, including such attractions as the capital Lhasa with the impressive Potala Palace, former home of the Dalai Lama; Tibet’s second city Shigatse, with the vast Tashilhunpo Monastery, part Buddhist monastery and part university; and an interesting scramble to a ruined fort above the town of Shegar, where Everest teams have gone to acclimatise ever since the days of George Mallory. The days in a jeep at high altitude meant that by the time we reached the foothills of Cho Oyu, we had gone a long way towards getting acclimatised for our climb. The expedition proper began with great optimism. 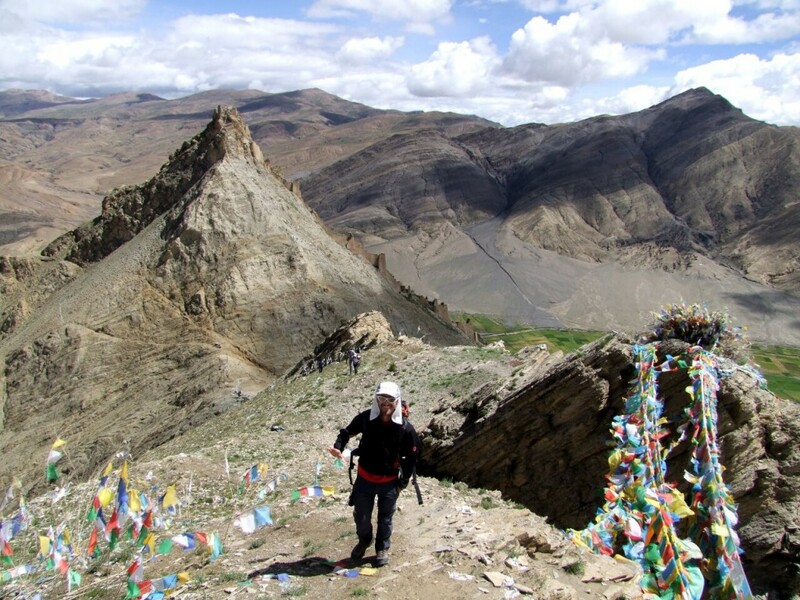 Chinese Base Camp, the traditional starting point for Cho Oyu expeditions, sits in the middle of a wide, shallow valley in the transitional zone between the rolling brown hills of Tibet, with wide open views which stretch to the far horizon, and the high alpine desert of the Greater Himalayas. Camp itself was pitched on grassy yak pastures pock-marked with little pika (or mouse-hare) burrows, but we only had to walk a short distance up the jeep track beyond to be among glaciated boulder fields with little or no vegetation. The two day walk from here to our main Base Camp, was along the lateral moraine of a vast glacier spilling down from the Nepalese border, sometimes on very rough track, but more often than not involving extensive boulder-hopping. Cho Oyu dominated the view in front of us, first its awkward-looking north face, with its sheer corniced wall of snow and rock, and latterly the easier-looking west face which we would be climbing. A rock band cut across the upper slopes of the west face, and an area of seracs crumpled up the route lower down, but there were ways across these obstacles which didn’t involve especially difficult climbing. The face looked quite benign and the weather had been kind during the walk in to afford us clear views of our objective. 5700m is extremely high for a base camp. Many of us, including myself, arrived with severe headaches which took a couple of days to clear. The Gamow bag (or portable altitude chamber) was produced twice for climbers to lie inside and recover from altitude sickness while their team mates pumped them with oxygen. Two members of the team had to be sent home when their symptoms became more serious, one with the onset of high altitude pulmonary edema (or HAPE) and the other with cerebral edema (HACE). Fortunately it only takes two long days from Cho Oyu Base Camp to be back at 1400m altitude in Kathmandu, where medical authorities are accustomed to dealing with acute mountain sickness, and both team members made a quick recovery as soon as they were back at a lower altitude. An 8000 metre peak is no picnic, and it never ceases to amaze me why people attempt to climb them without getting some experience of what it’s like at that sort of altitude. Expeditions to mountains such as Kilimanjaro, Mera Peak, Aconcagua and Lhakpa Ri offer both a natural altitude progression and a rich and rewarding mountaineering experience, so that by the time you attempt an 8000er you not only know what to expect, but have become so used to the conditions of life on a big expedition that you’re able to enjoy the experience. Mountaineering is not just an extreme challenge to appreciate in retrospect, but an activity to enjoy in the present, and I’ve never understood why people feel the need to jump right into something when they could be having much more fun by working their way up gradually. It seems such a waste of precious time and money. Thankfully there were only two casualties in the early stages of the expedition, and the majority of the thirteen clients who remained were acclimatising well and had a realistic chance of reaching the summit. We also had a very comfortable base camp, complete with shower tent, email access, heated and carpeted mess tent, and even a DVD player. Most importantly of all, we had an Australian cook whose food was not just the best I’ve ever had on any trek or expedition, but was streets ahead of anything else I’ve ever come across. There was no danger of anyone going hungry. The weather, on the other hand, was less positive. For most of the first three weeks it was extremely mild, but it snowed every day. The mornings nearly always started clear, but would eventually cloud over before bringing on the snow. Unhappily the time in the day when the snow began kept getting earlier. When we first arrived, the snow tended to begin midway through the afternoon, but after three weeks at base camp it usually began snowing not long after 10 in the morning. Despite this, we were making progress up the mountain. 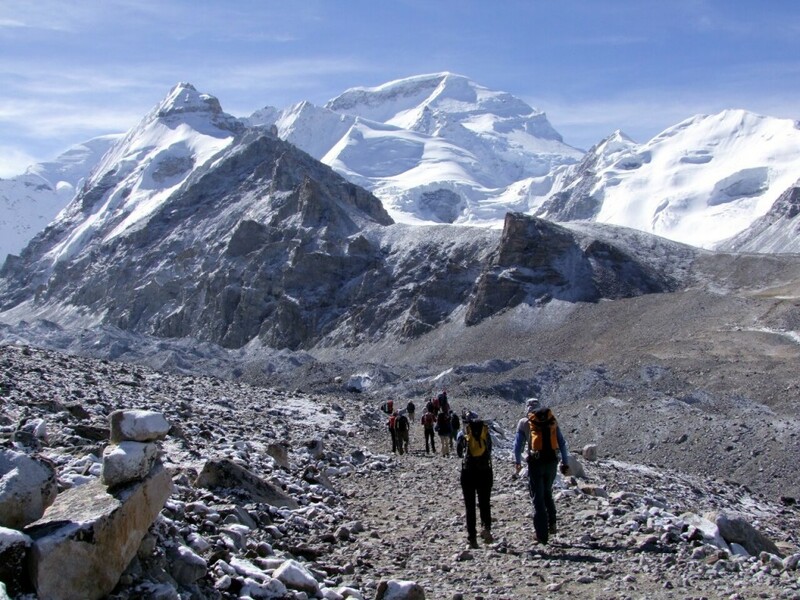 We walked for two hours across the rough moraine of the Cho Oyu Glacier to the foot of Cho Oyu, where we turned round at an interim depot camp on a small elevated knoll up a side valley. Then a couple of days later we returned and climbed up an exhausting scree slope to Camp 1. On the next visit we stayed a night at Camp 1, on a wide plateau of snow beneath a broad ridge which rose up the mountain in a series of steep snow-clad saddles. The next morning we ascended the ridge on fixed ropes to the base of the serac wall, Cho Oyu’s most notable technical obstacle, before returning to base camp. By now I was feeling confident, and most of us were in good condition. The ascent to the serac wall had filled me with greater confidence, as it wasn’t as high or as steep as I’d feared, and at 6800m I was still moving well. The weather continued to be a problem, however, especially for those responsible for preparing the route higher up. Our amazing 10-strong Sherpa team, who had around 50 Everest ascents between them, had no difficulty in establishing Camp 2 for us, considerably easing our burden by carrying and pitching tents, taking up all food and even some of our more bulky personal kit such as sleeping bags. The crew of the Tibetan Mountaineering Association were in more serious trouble, however. 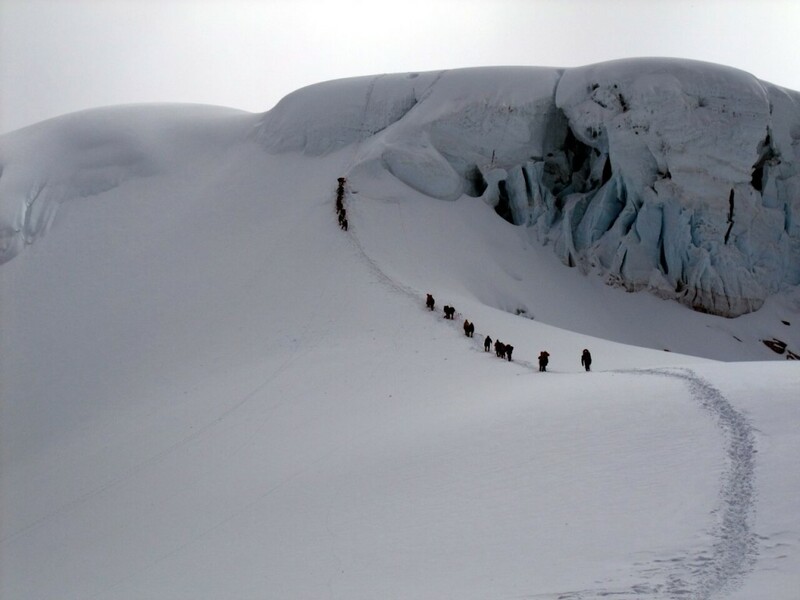 Despite the heavy snow, they continued to push the rope fixing higher up the mountain, and on 17 September seven members of their team were fixing ropes high above Camp 3 when they were caught in an avalanche which swept them all the way over the sheer cliffs of the rock band which they’d just ascended. Remarkably, all of them survived, but most suffered serious injuries such as broken arms and ribs. Members of our Sherpa team were among those who assisted them down from Camp 3 all the way to Base Camp, and we even had a doctor specialising in accident and emergency medicine among our number, who assisted in evacuating them to the road at Chinese Base Camp in the middle of the night during a blizzard. Despite this setback, our progress continued. 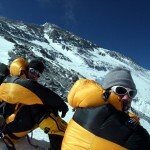 We returned to Camp 1, then pushed on the following day to Camp 2 at 7150m, where we spent a night. The following day we returned to Base Camp in a howling blizzard, and were very lucky. Two Sherpas from another team whom we passed on a small plateau above the serac wall continued up, and were caught in another avalanche a few minutes later. One was completely buried, but again the mountain gods were smiling and both survived without injury. The next day we could see from Base Camp that a huge fracture line had appeared above the serac wall. Rumours started reaching us that part of it had collapsed. The weather had changed, however. Our descent from Camp 2 marked the last day of snow. It was suddenly much colder, but the skies were clear and remained so for the entire day. There was very little wind, and it was perfect weather for a summit push. On 27 September ours began. Half our team, who were going to be attempting the summit from Camp 3 at 7450m, left for Camp 1 that day. The remainder of us, who would attempt the summit from Camp 2, remained at Base Camp to leave the following day. We sat in the sun watching the rope fixing teams above Camp 3 through binoculars. They moved quickly across the rock band and were heading towards the summit. Everything seemed to be falling into place when everything changed in an instant. Five of the rope fixers were caught in another avalanche which carried them 300 to 400 metres down the mountain, and they were only prevented from being swept over the rock band when the rope linking them together caught around a rock. Again, all of them survived, though one was in a state of shock which didn’t abate till he was examined by a doctor at Camp 1. For a third time we had been incredibly lucky, but this heralded the end of the expedition, not only for ourselves, but nearly everybody on the mountain. Although five Sherpas had climbed above the rock band to fix rope, five more had wisely turned around, concluding that snow conditions were too dangerous. The many weeks of mild temperatures and heavy snow had amassed several feet of fine powder which hadn’t glued together and consolidated. Then the sudden drop in temperature had created a hard crust on top. These were prime avalanche conditions, but the slopes weren’t avalanching. Wind speeds were light, so nothing was blowing off, but this was only a short weather window. In a few days wind speeds were forecast to increase significantly, to speeds which would rule out a summit attempt. We had run out of time, and so had everybody else. We went home, and although two German climbers reached the summit a few days later, in reportedly dangerous conditions, an Italian climber died and nobody else reached the summit this autumn at all. Cho Oyu, supposedly the easiest 8000 metre peak in the world, had closed its gates. It was a season in an dozen. Bad luck, but that’s mountaineering. It had been an experience, though. Jagged Globe had looked after us well; we were well supported, and had conditions been right I was confident that a good number of us would have made the summit in relatively comfortable circumstances. My only gripe was group size. We had a decent team of people who were good company, but there were too many of us. It meant that many of the luxuries we were paying extra for were thinly spread. The dining tent was too small for all of us, and many was the meal I spent squashed up against a video screen which swung across my face, a video screen, incidentally, which I gained no further enjoyment out of because the lowest common denominator meant that we watched violent action movies every night, which are of no interest to me. Some days I didn’t get to use our internet connection because the queue to use it was too long, and the one skills training session we spent on the ice of the glacier at Base Camp ended up being a bit farcical. By the time we’d walked to a suitable ice wall, ropes had been fixed, and each of us in turn had climbed up, traversed then abseiled down again before walking back to Base Camp, three hours had passed, and we’d each spent just 10 minutes on the ice. A bit pointless. Perhaps more of a loss was that our group was so big, and our Sherpa support team so big, that we spent hardly any time with them. During the day they disappeared off to socialise with Sherpas from smaller teams, and we only saw their smiling faces briefly when they ran past us on the mountain. At our farewell meal for them in Kathmandu I found myself shaking hands with strangers who had been moving heaven and earth for me. But the food had been amazing. Steak and kidney pie? Pork scratchings? My mouth waters. ← Baruntse post mortem: bad luck or bad decision-making? Hey Mark! 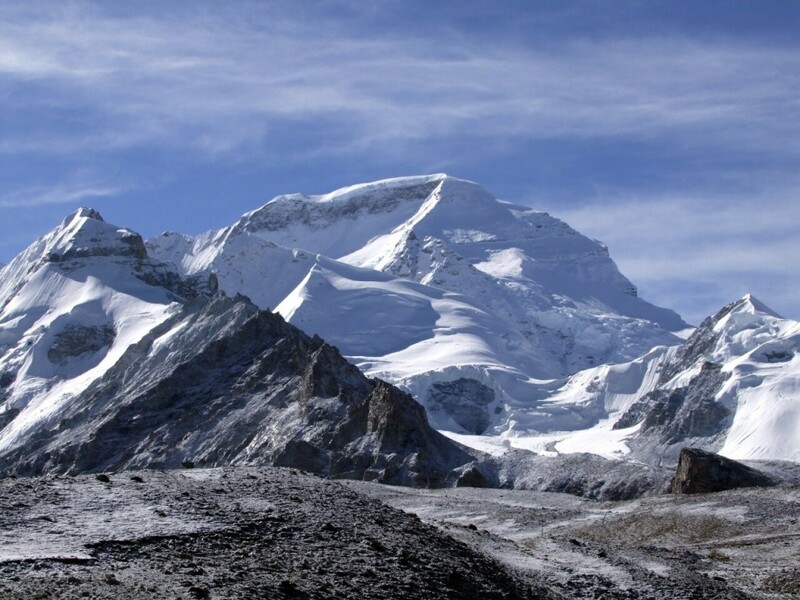 Great to find your site and read the story of Cho Oyu. It reminded me of the highs and lows, and filled in what I missed by leaving early. 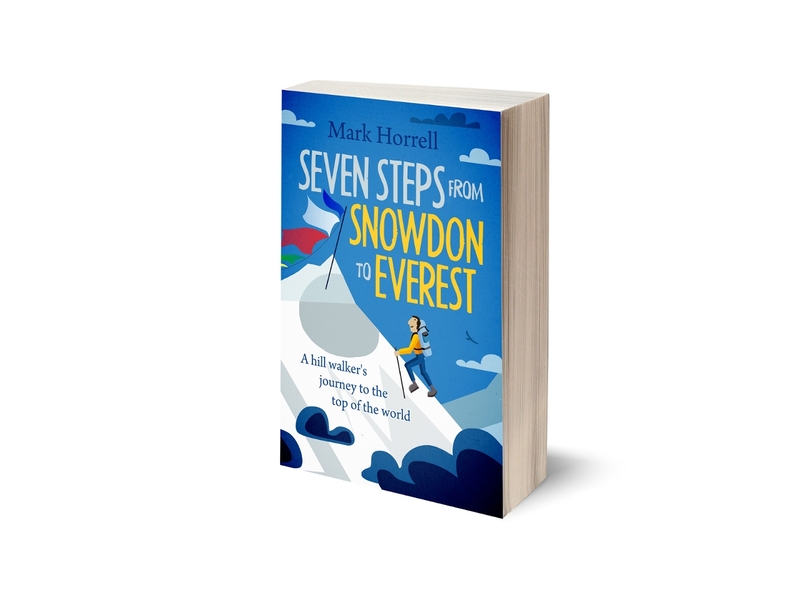 Best wishes to Steve and Rich on Everest and hope Mark P can recover to join them. 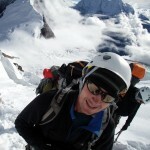 Also best wishes to Ron on Makalu although I hear he may have stopped at Camp 2? Just received emails from Steve and Mark P this morning. I’m totally amazed at those two guys on the 737 Challenge! Mark is fighting through his discomfort and time will tell. Please pass on to Robert all the best on Makalu. Latest report indicates they are heading down with some summits, but unknown who yet. Yes, it sounds like Jagged Globe did get summits on Makalu yesterday. Some achievement, though no surprises two of the big guns, Robert and Adele were among them. I don’t know about anyone else. For me I certainly hope to keep trying for an 8000er, but the nature of my work situation means I can’t plan very far ahead, usually only a couple of months, so I don’t even know what mountains I’ll be climbing this year yet. Good luck if you decide to have a go at Shish. Hopefully things will work out better for all of us. Fascinating reading…I have not yet read Tigers of snow but read Paths of glory. Its realy wonderful. Heehee, yes, I find Archer novels work well in the toilet tent. 😉 Tenzing, on the other hand, deserves a place at the dining table!